Objective Maternal alcohol use disorder is a risk factor for a range of developmental outcomes in children. This study examines school achievement in children of Indigenous and non-Indigenous mothers with an alcohol-related diagnosis. Design, setting and participants This is a Western Australian population cohort study of mothers with a record of an alcohol-related diagnosis classified by the International Classification of Diseases Revisions 9/10 codes as recorded on administrative databases, and of their offspring born between 1989 and 2007 (n=18 486 exposed children), with a frequency matched comparison cohort of mothers with no record of alcohol diagnosis and their offspring (n=48 262 comparison children). Outcomes Records were linked with school achievement data for numeracy and literacy from Years 3, 5, 7 and 9 (age range: ~8–14 years) based on statewide and national testing. Mixed multivariate models with a random intercept per child were used to assess the relationship between exposure and the timing of exposure with failure to meet minimum standardised benchmarks. Results Academic achievement was lower in all testing domains (reading, writing, spelling and numeracy) among children of mothers with an alcohol diagnosis and persisted across all year groups examined. The highest ORs at Year 9 for non-Indigenous children were in reading (adjusted OR (aOR) 1.6, 95% CI 1.4 to 1.8) and in writing for Indigenous children (aOR 2.0, 95% CI 1.8 to 2.3). Conclusion Children of mothers with alcohol use disorders are at risk of not meeting minimum educational benchmarks in numeracy and literacy, with the risk highest among Indigenous children. A major strength of this study is the use of a population-based cohort of non-Indigenous and Indigenous mothers with a matched comparison cohort. The exposed cohort (having an alcohol diagnosis) was identified based on standard International Classification of Diseases Revisions 9/10 codes. The educational outcomes are standardised measures and comparable with national and state benchmark data. Loss to follow-up is unavoidable—71.1% of the birth cohort linked to an achievement record partly because data were limited to public schools. Participation rates were also lower in the exposed versus the comparison cohorts. Another limitation is the definition of the cohort—these are serious alcohol use disorders and there will be women in the comparison cohort who may use alcohol at high levels. Children of mothers with alcohol use disorders are placed at risk prenatally and through exposure to numerous environmental and psychological risk factors postnatally. Heavy prenatal alcohol exposure, in particular a binge pattern of exposure, increases the risk of a range of neurodevelopmental problems, termed fetal alcohol spectrum disorders (FAS).5–7 Environmental risks include parental mental health problems, poor parenting skills and low supervision, family disruption and conflict, family mobility, and social isolation.8 9 Cognitive, behavioural, emotional, social and other neuropsychological deficits are all mechanisms through which prenatal5 10 and environmental8 9 exposure to maternal alcohol disorders could lead to poorer academic outcomes. Studies examining the impact of prenatal alcohol exposure on school achievement by various measures, including psychometric assessments,11–17 parent/self-rated assessments,12 teacher-rated assessments12 14 and standardised school-based assessments,14 18–22 have found that the most consistent negative association was in respect of the impact of binge drinking. Findings are mixed as to whether particular domains of learning are more strongly disrupted. In the Seattle Longitudinal Study on Alcohol and Pregnancy (offspring of mothers oversampled for heavier drinking and smoking), the most consistent effect of prenatal binge drinking was in respect to lower performance on arithmetic tests as reported at ages 7, 11 and 14, although the effects were seen in other learning domains.14–17 In studies by Goldschmidt and colleagues based on a low-income cohort, deficits were found in mathematics, reading and spelling ability at age 611 12 but not in mathematics at age 10.12 Howell et al found effects on standardised tests in mathematics but not reading or spelling at age 15.19 In contrast, in a Western Australian (WA) study, O’Leary et al only found effects for binge drinking in the first trimester on the reading test but not on numeracy, writing or spelling at age 8–9 years.20 Studies based on the Avon Longitudinal Study of Parents and Children have linked maternal binge drinking with lower overall performance on national standardised tests among 10 to 11-year-olds.18 21 Variations between learning domains may be accounted for by methodological differences in existing studies. This study uses routinely collected linked population-based health and education data to examine the school achievement of children of mothers who have an alcohol-related diagnosis, which is a proxy for maternal alcohol use disorder. This study overcomes problems associated with recruiting and retaining mothers with a diagnosed alcohol use disorder and their children in longitudinal studies,10 23 and addresses many of the methodological limitations of previous studies such as classification of alcohol consumption, lack of a comparison cohort, sample bias and inconsistent adjustment for known confounders.6 It was hypothesised that children of mothers with an alcohol-related diagnosis would have a significantly higher risk of failing to reach minimum education benchmarks in numeracy and literacy. This is a cohort study using linked population administrative data. The original birth cohort has previously been described.24 All women with a birth recorded on the WA Midwives Notification System (MNS) between 1983 and 2007 were in scope. Mothers (and their offspring) are classified as being Indigenous if they have at least one record on the MNS of being either of Australian Aboriginal or Torres Strait Islander descent. Figure 1 shows how the study cohorts were selected for this paper. Flow chart of cohort selection and numbers participating in study. HMDS, Hospital Morbidity Data System; ICD, International Classification of Diseases; NAPLAN, National Assessment Program – Literacy and Numeracy; WA, Western Australia; WALNA, Western Australian Literacy and Numeracy Assessment. Ethics approval for the conduct of the study was granted by the Princess Margaret Hospital Human Research Ethics Committee (No. 1244/EP), the WA Department of Health Human Research Ethics Committee (No. 2011/34) and the WA Aboriginal Health Ethics Committee (No. 134-04/06). The exposed cohort comprised women who gave birth in WA between 1983 and 2007, and had an alcohol-related diagnosis according to the International Classification of Diseases Revisions 9/10 (ICD-9 or ICD-10) from the medical records coded by trained coders. The diagnosis was identified through routinely collected administrative data, including the Hospital Morbidity Data System (HMDS/hospital inpatients), mental health outpatients and the Perth-based Drug and Alcohol Office. The ICD-9 and/or ICD-10 codes included alcohol-related mental and behavioural disorders, an alcohol-related disease with 100% attributable fraction and other alcohol codes (see online supplementary table 1).24 There were 8519 mothers with an alcohol-related diagnosis and 18 486 births to these mothers between 1989 and 2007. The comparison cohort consisted of a random selection of mothers with a birth recorded on the MNS without an alcohol-related diagnosis recorded on any of the data sets. The comparison cohort was frequency-matched to the exposed cohort on maternal age within maternal race and year of birth of her child. The ratio of comparison to exposed cohorts was 3:1 for non-Indigenous children and 2:1 for Indigenous children. There were 38 490 comparison mothers and 48 262 comparison births between 1989 and 2007. Exposure was examined as (1) a binary variable (yes/no) and (2) the timing of recording of alcohol-related diagnosis in relation to pregnancy using a hierarchical coding as previously described.24 Being classified as having a diagnosis during pregnancy did not exclude a diagnosis from also being recorded before or after pregnancy. School achievement data came from the Western Australian Literacy and Numeracy Assessment (WALNA) for assessment years 1999–2007 and the National Assessment Program – Literacy and Numeracy (NAPLAN) tests for assessment years 2008–2011. WALNA was a statewide testing programme in numeracy, writing, reading and spelling undertaken by all students in Years 3, 5 and 7 (average age 8, 10 and 12, respectively). From 2005 to 2007, numeracy, reading and writing were also assessed in Year 9. Benchmarks for minimum standards of performance in WALNA tests were provided by the WA Department of Education. The birth cohort data were linked with the WA Department of Education data (public schools only) by the WA Data Linkage Unit using probabilistic matching techniques.26 Data were successfully linked to at least one achievement record for 71.1% of children. Participation in WALNA and NAPLAN testing was higher in non-Indigenous students compared with Indigenous students, and lower among children of mothers with an alcohol diagnosis than children in the comparison cohort (table 1). The relative difference in participation between children of mothers with an alcohol diagnosis and those of comparison mothers was higher among Indigenous students (range: 3.1%–8.6% compared with 1.2%–2.6% among non-Indigenous students). Participation was lowest for Indigenous children of mothers with an alcohol diagnosis during NAPLAN testing (74.2%–77.8%). Overall, 45 697 children had participated in at least one test in the follow-up period. WALNA and NAPLAN test results were combined with a maximum of four test results per child (a maximum of four for WALNA and four for NAPLAN). When combined, 9173 students had one test result, 12 167 had two test results, 10 771 had three test results and 13 586 had four test results. There were 7804 exposed non-Indigenous children and 4887 exposed Indigenous children in the exposed cohort. Three times the proportion of Indigenous mothers (2.6%) compared with non-Indigenous mothers (0.8%) had an alcohol diagnosis record during pregnancy. The proportions of non-Indigenous and Indigenous mothers with an alcohol diagnosis ‘greater than 1 year prepregnancy’ were 6.4% and 5.2%, ‘up to 1 year prepregnancy’ were 1.7% and 2.2%, ‘up to 1 year postpregnancy’ were 0.9% and 1.7%, and ‘greater than 1 year postpregnancy’ were 16.2% and 19.3%, respectively. Child factors included were gender, preterm birth (born <37 weeks’ gestation) and low birth weight (<2500 g). Maternal factors included were parity and marital status, WA health region, and the Australian Bureau of Statistics Socio-Economic Index for Areas (SEIFA), both based on postcode of residential address at the time of the birth. Analyses were further adjusted for maternal mental health diagnosis (ICD-9/ICD-10 codes on the HMDS or the mental health outpatient data) and maternal record of illicit drug diagnosis recorded on either the HMDS, mental health outpatients and/or the Drug and Alcohol data set. Smoking status during pregnancy was available on the MNS from 1998. All analyses were run separately for non-Indigenous and Indigenous children. The frequency matching variables and all confounders were included on the basis of significance in univariate testing. Missing data for SEIFA were included as categories, whereas cases with missing data for marital status and birth weight were dropped in modelling. The significance of differences in the distribution of maternal and child characteristics between those with a maternal alcohol diagnosis and those without was determined using a χ2 test. Initially, the relationship between maternal alcohol-related diagnosis and failure to attain WALNA and NAPLAN benchmarks for each domain was assessed with conditional logistic regression using PROC LOGISTIC in SAS V.9.4. The combined benchmark data were then modelled using the GLIMMIX procedure in SAS with a random intercept per child. As there were siblings included, we also tested a nested random effect of child within family, but this made no difference to the results. First, an interaction was modelled between exposure and testing year to produce estimates for the exposed versus comparison cohorts in each testing year. Second, the effect of the timing of maternal alcohol-related diagnosis on achieving benchmarks was tested. The significance of the difference in adjusted OR (aOR) between non-Indigenous and Indigenous groups was determined by calculating CIs for the difference between estimates. The predicted probabilities reported in figure 2A–D have been computed using the LSMEANS statement in PROC GLIMMIX for ethnicity by maternal alcohol exposure by year of testing. These values represent the predicted probability of not meeting the benchmark by Indigenous status and alcohol exposure while using the average value across the cohort for all other variables in the model. As such these marginal probabilities model the average probabilities in the specified groups. Predicted probability of children not reaching benchmarks in numeracy, reading, writing and spelling among exposed versus comparison children by Indigenous status and testing domain. Sensitivity analysis was conducted to determine whether adjustment for smoking status altered the findings for the years in which smoking status was available (1998 onwards). This meant restricting the analysis to NAPLAN tests only for years 3, 5 and 7. A higher proportion of mothers with an alcohol diagnosis than comparison mothers were never married (p<0.001) (table 2). 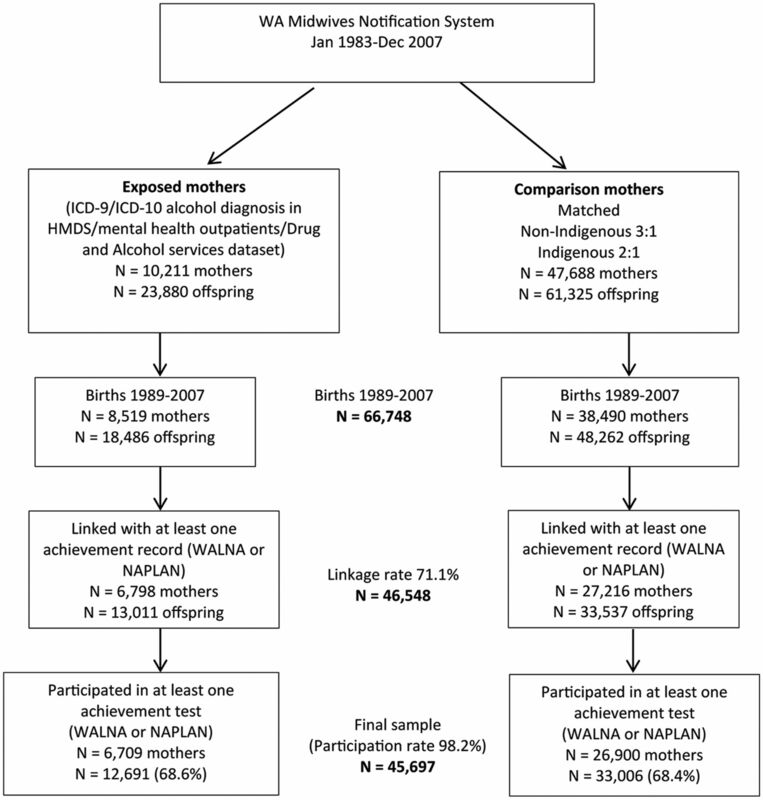 Among non-Indigenous mothers, higher proportions of mothers with an alcohol diagnosis lived in more disadvantaged areas compared with comparison mothers, which was not the case for Indigenous mothers. There was, however, a higher proportion of Indigenous mothers with an alcohol diagnosis with missing information for SEIFA. A higher proportion of mothers with an alcohol diagnosis had a record of illicit drug diagnosis, mental disorder diagnosis and maternal smoking during pregnancy than comparison mothers (all contrasts significant at p<0.001). Mothers with an alcohol diagnosis had a higher parity than comparison mothers, and a higher proportion of their births were low birth weight and preterm (all contrasts significant at p<0.001). For all tests the proportion of children failing to meet benchmarks was higher in the exposed than comparison cohorts (table 3). Proportions not meeting benchmarks were higher for Indigenous than non-Indigenous children in both cohorts. Before adjustment for confounding, the odds of failing to achieve the benchmarks were similar for both non-Indigenous and Indigenous children of mothers with an alcohol diagnosis and indicated an increased likelihood of failure ranging between 1.5 and 2.3 times higher than comparison children. After adjustment for confounders, children of mothers with an alcohol diagnosis had greater odds of failing to reaching benchmark status than comparison children (table 4). The ORs of not meeting benchmarks in the exposed cohort ranged from 1.2 to 1.6 among non-Indigenous children and from 1.4 to 2.0 among Indigenous children. The highest ORs at Year 9 for non-Indigenous children were in reading (aOR 1.6, 95% CI 1.4 to 1.8) and in writing for Indigenous children (aOR 2.0, 95% CI 1.8 to 2.3). 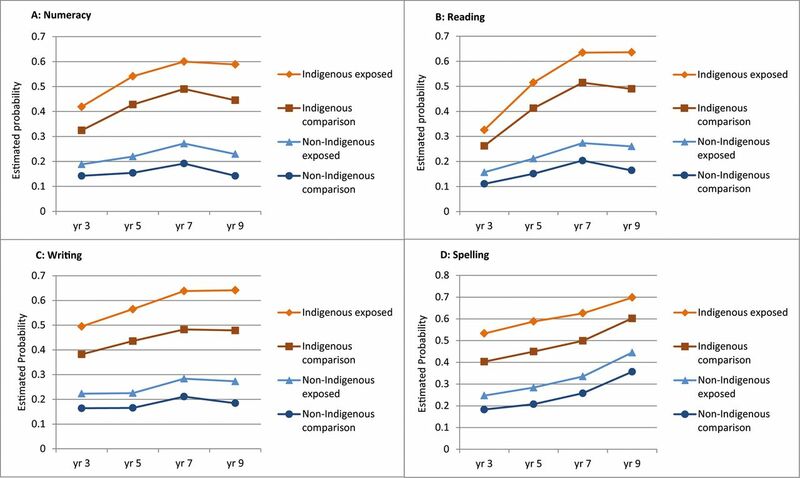 The odds of failing to meet benchmarks in exposed versus comparison cohorts were significantly higher among Indigenous children than non-Indigenous children at all testing years for writing, at Years 3, 5 and 7 for numeracy and spelling, and at Year 7 for reading. Figure 2A–D displays the predicted probabilities of not meeting benchmarks by Indigenous status and diagnostic status. Overall it can be seen that the difference in estimated probabilities of not reaching benchmarks between children of mothers with an alcohol diagnosis and those in the comparison cohort was larger for Indigenous children than non-Indigenous children. There was a general pattern of increasing probability of not reaching benchmarks from Year 3 through to Year 7, with no increased risk at Year 9, a pattern more pronounced in the Indigenous exposed and comparison cohorts. The exception was for spelling where the risk increased further at Year 9 for Indigenous and non-Indigenous children regardless of exposure. There was no consistent pattern in terms of strength of association between diagnostic status and failure to reach benchmarks by the timing of the record of maternal alcohol-related diagnosis (table 5). There were some differences between Indigenous and non-Indigenous children. When a maternal alcohol-related diagnosis was recorded during pregnancy, the odds of not reaching benchmarks across testing domains were higher for Indigenous children (aOR range: 2.0–2.4) than non-Indigenous children (aOR range: 1.4–1.6). These differences were statistically significant at p<0.05 for writing and spelling. Likewise, these differences were significant when a maternal alcohol-related diagnosis was recorded more than 1 year prepregnancy, up to 1 year prepregnancy or 1 year postpregnancy. Using the restricted data set, the odds of failure to reach benchmarks in the exposed versus comparison cohorts are modestly reduced with adjustment for smoking in some testing domains, but mostly still remain significant (see online supplementary table 2). The aORs that were not statistically significant (in particular, for Year 7 in numeracy, reading and spelling in the non-Indigenous group) were not significant in the models without and with adjustment for smoking status. This is the first Australian population study to use linked administrative data to examine school achievement using standardised testing among children of mothers with an alcohol-related diagnosis. Overall the timing of the record of maternal alcohol diagnosis made little difference to the strength of association with school achievement. The detrimental effect of an alcohol-related diagnosis during pregnancy is consistent with previous studies that have mostly used measures of binge drinking.14 18–22 In the only other study with comparable benchmark data, O’Leary et al found that higher proportions of children whose mothers reported to be drinking heavily in the first trimester of pregnancy failed to achieve benchmarks in reading, spelling and writing (but not numeracy) than children of mothers who abstained throughout pregnancy.20 In contrast to our findings, Alati and colleagues found no significant association between postnatal binge drinking by the mother or a partner and school achievement, thereby attributing findings to intrauterine mechanisms.18 Furthermore, a previous study using this cohort found that the risk of intellectual disability was highest when a maternal alcohol-related diagnosis was recorded during pregnancy.29 It is therefore difficult to determine what proportion of the association can be attributed to prenatal alcohol exposure and therefore FAS, and the proportion that may be due to unadjusted confounding factors such as low levels of maternal education,13 20 unstable and overcrowded housing,18 21 and problems with family, peers or at school.8 9 Another possible explanation is that women with alcohol-related diagnoses are likely to have persisting problems but no health service record of these during pregnancy. A major strength of this study is the use of a population-based cohort of non-Indigenous and Indigenous mothers, and information about diagnosis that precedes the measures of educational outcomes. In addition, the exposed cohort (having an alcohol diagnosis) was identified based on standard ICD-9 and ICD-10 classifications, and educational outcomes are comparable with national and state benchmark data. Our results are therefore generalisable in the Australian context, and results for the non-Indigenous population are comparable in other populations that collect standardised school performance data, although similar studies in other settings may also reveal significant differences by ethnicity. Loss to follow-up is unavoidable—71.1% of the birth cohort linked to an achievement record partly because data were limited to public schools. Participation rates were also lower in the exposed versus the comparison cohorts, and especially among Indigenous children of mothers with an alcohol diagnosis. Another limitation is the definition of the cohort—these are serious alcohol use disorders and there will be women in the comparison cohort who may use alcohol at high levels, but have not had a hospital admission or contact with mental health or drug and alcohol services for it. The presence of FAS cases in the comparison cohort as previously described24 attests to this misclassification, which will lead to a bias in the measure of effect towards the null. Finally, as an observational study, it is likely that there are a number of residual confounding factors that we are unable to adjust for that may account for the greater risk of academic failure among children exposed to maternal alcohol disorders. These include factors associated with the family, school and neighbourhood environment, as well as other child development issues associated with alcohol exposure and cognitive development. Altogether, 18 486 children born between 1989 and 2007 in WA were identified as having a mother with an alcohol-related diagnosis (7515 Indigenous and 10 971 non-Indigenous children). A high proportion of children of mothers with an alcohol-related diagnosis failed to meet minimum benchmarks, particularly Indigenous children. Identifying and addressing harmful maternal alcohol use in pregnancy and providing support to these mothers could improve educational outcomes of children. Furthermore, early identification and interventions aimed at targeting children exposed to maternal alcohol use disorder (and multiple risks) may improve longer term educational outcomes for these high-risk children. We thank the staff of the Western Australia (WA) Data Linkage Unit for access to the WA Data Linkage System and for their assistance in obtaining the data, and the WA Health and Education Data Custodians for access to the core data sets. National Education Reform Agreement. 2013 http://www.federalfinancialrelations.gov.au/content/npa/education/national-agreement_201412.pdf (accessed 17 Aug 2016). Australian Institute of Health and Welfare. A picture of Australia’s Children 2012. Canberra: AIHW, 2012. http://www.aihw.gov.au/publication-detail/?id=10737423343. (accessed 17 Aug 2016).
. The development of human capability across the lifecourse: perspectives from childhood.. Australas Epidemiol 2009;16:6–10.
. Literature review: parental alcohol misuse and the impact on childen. Sydney: NSW Dept of Community Services, 2006.
. Children of substance abusers: overview of research findings. Pediatrics 1999;103:1085–99.
. Prenatal alcohol exposure and attention learning and intellectual ability at 14 years: a prospective longitudinal study. Early Hum Dev 2007;83:115–23.
. Methodological issues in epidemiological, prevention, and treatment research on drug-exposed women and their children. Rockville, MD: US Department of Health and Human Services National Institute on Drug Abuse, 1992. https://archives.drugabuse.gov/pdf/monographs/117.pdf (accessed 17 Aug 2016). Australian Curriculum, Assessment and Reporting Authority 2012. NAPLAN achievement in reading, pursuasive writing, language conventions and numeracy: national report for 2012. Sydney: ACARA, 2012. http://www.nap.edu.au/_resources/NAPLAN_2012_National_Report.pdf (accessed 17 Aug 2016).
. Population-based linkage of health records in WA: development of a linked database. Aust N Z J Public Health 1999;23:453–9.
. The harmful use of alcohol amongst indigenous Australians. 2010 http://www.healthinfonet.ecu.edu.au/uploads/docs/alcohol_review_june_2010.pdf (accessed 17 Aug 2016). Contributors CO and CB conceptualised the study, obtained funding and arranged for data linkage along with JS and SRZ. NC and SEJ cleaned and coded the education data, undertook the analysis and drafted the manuscript. DL provided expert advice to the statistical analyses and contributed to the initial draft of the paper. All authors reviewed, revised and approved the final manuscript. Funding The project is funded by an Australian Research Council Discovery Project (Project ID DP140101573). Ethics approval Princess Margaret Hospital HREC, WA Department of Health HREC and WA Aboriginal Health Ethics Committee. Data sharing statement There is no additional unpublished data available from this study.